The captain of the Italy team GM Arthur Kogan was in Sofia and found some time to speak with our editor GM Marian Petrov. MP Hello Arthur, welcome to Sofia. You are here for the VIII World Team Chess Championship for Blind and Visually Impaired. Can you tell us more about it? AK It was a great event mainly because I saw it was done with care and love for players that really need and appreciate the efforts! My team is based on good players but most of them also have hard daily jobs so it was hard to expect too much in the field of teams with more active players. But they gave their best and finished in very respected 9th place! MP You are the coach of the Italian National team for many years now. Recently you won the Mitropa cup. Can you tell us more for the event. AK Yes, it’s a pleasure to train a quite ambitious young team (Moroni, The Italian Champ is only 18! ), and together with the legendary veteran Godena (who had an amazing result! ), the already experienced fighters such are Vocaturo and Brunello, and the new solid addition of Valsechi, we managed to get a great team spirit that helped us to save and even win few crucial games… And achieve one of the best results ever for the Italian team! MP How is the preparation for the Olympiad going and what are your expectations for your team? 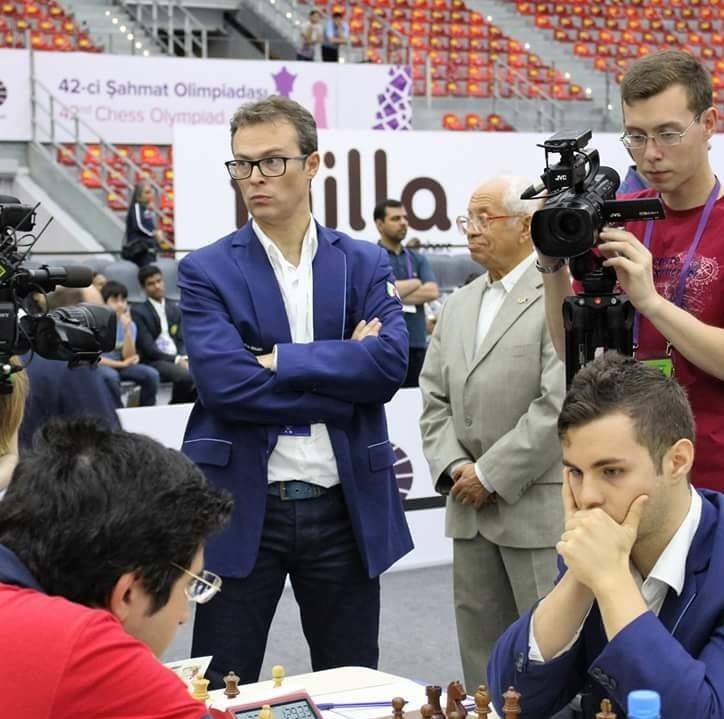 MP Fabiano Caruana was in the past part of your team. Do you miss his presence and do you think he has chance in the World Championship match against Magnus? AK Well, we had great times with Fabiano and I was happy with his great efforts for the team, but as he himself noticed and told me, he knows and saw we could also do very well without him. But definitely I wish him the best of the best vs Magnus, I know he got the talent to beat the champion and I just hope he will prepare and come in his best form. MP You are living in Spain and running the academy Olalachess. Can you tell us about this project, how and when it has started? AK Yes, I live in Spain since more than 18 years and except training camps in my town and in Salou I mainly work online and with the so many good results of the students I am still motivated to teach and share more of my wide experience of work with all kind of chess levels and ages, mainly looking for new ‘Impossible Missions’ to complete. MP You are from Israel, you live in Spain, coaching Italy. You speak Russian and English and have Bulgarian wife. Which country do you feel as home? AK Well, since I lived in so many countries I am quickly adapted to new places…Now I am mainly Catalan. But my heart will always belong to Israel, where I grew up and learned so much about so many important life values. MP How did you start to play chess and who were the people, who were helping you during the years? What is your biggest achievement in chess? AK I started being about 6 years old thanks to my father who helped me a lot in the start and also got me many good private trainers to motivate me to improve quicker… Between them Vistaniescki and GM Liberzon probably did the biggest influence but because they didn’t believe in me so much, the big work to become a GM was done mainly by… Me. So it’s probably my biggest achievement to keep on and fulfill my dreams…and later win so many open chess tournaments around the world. MP As a famous coach and player what is your advice for the young kids, who want to become great players and what training plan they should follow? MP Did you follow the Biel tournament? AK You know what happened… Shakh is a genius! MP Recently many young kids have become GMs or have very high ratings. What do you think is the future in chess if kids can become GMs at 10-13 years old? AK Sure, there are no limits since with the help of technology chess became a kind of Video game… So training and playing online completely changed the game. MP How important is computer preparation in your practice and how many hours you train per day? AK Sure it’s very important, but still my main weapon as a player and as a trainer (Also of many top players during last years) is trusting my logical brain and search for creative but effective solutions in very complicated positions… Luckily the engines are still far away from Gods, we just have to learn to discuss and analyze with them as a great training tool, and not take their output as the final word.